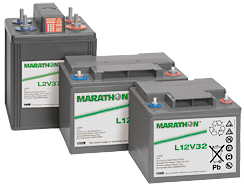 The Marathon Battery series is based on AGM technology. Because of their exceptional high-current capabilities and user-friendly performance rating, they are suitable for use in high-performance UPS systems with short bridging times as they are in all other areas of backup electricity supply technology. According to EUROBAT, batteries of the Marathon series have a long lifespan of 10-12 years.